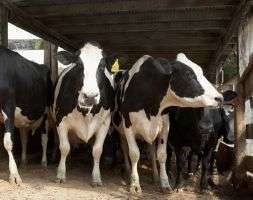 Bovine tuberculosis led to the slaughter of 35,000 cattle in 2009. The study, by researchers at the Medical Research Council (MRC) Centre for Outbreak Analysis and Modelling at Imperial College London, is published today in the Royal Society journal Biology Letters. The findings come as the Government prepares to decide whether to license farmers to organize the widespread culling of badgers over areas of 150 square kilometers or more in western England. Bovine TB is a major animal health problem in Britain. In 2009, one in every 10 cattle herds tested showed evidence of bovine TB, leading to 35,000 cattle being slaughtered. In the last decade, the slaughter of infected cattle has cost around £500 million to the taxpayer. Efforts to control the disease have been hampered by the persistence of Mycobacterium bovis, the bacterium that causes bovine TB, in the wild badger population, and transmission of the disease between species. The new analysis found that the presence of any reactive culling activity in the previous year within one kilometre of a herd more than doubled the risk of bovine TB, even after adjusting for the number of confirmed outbreaks nearby. The number of badgers culled in the vicinity of the herd was also associated with increased bovine TB risk. The findings may be linked to the observation that surviving badgers in a partly-culled group wander over a larger area, increasing their contact with neighbouring cattle. This is known as the perturbation effect. The analysis was based on data from the Randomised Badger Culling Trial (RBCT), set up in 1998 by the Department for Environment, Food and Rural Affairs (Defra) to evaluate the impact of badger culling on bovine TB risk in cattle. In the RBCT, trial areas were randomly assigned to three strategies: repeated proactive culling across the whole area; reactive one-off localized culling on and around farms following outbreaks, and no culling. The first analysis of trial data, published in 2003, found that localised badger culling increased the incidence of bovine TB in cattle, leading to reactive culling being suspended. However, some researchers questioned the way in which the results were interpreted. The new analysis, using data from 1998 to 2007, considered only herds in the reactive culling areas. The researchers carried out a case-control analysis of 604 pairs of herds, comparing herds with confirmed bovine TB outbreaks with herds that were tested but revealed no evidence of infection. More information: Journal reference: Vial, F. & Donnelly, C.A. Localised reactive badger culling increases risk of bovine tuberculosis in nearby cattle herds. Biology Letters, published online 13 July 2011.